When collectors of US coins are asked to identify the most beautiful coins in their collections, they usually include the Flying Eagle Cents of 1857–1858 near the top of their lists. With only two years of regular production, a complete set is attainable in decent condition at a reasonable cost. In our postings about coins, we hope to increase your enjoyment of the hobby by exploring the context in which these coins first appeared. 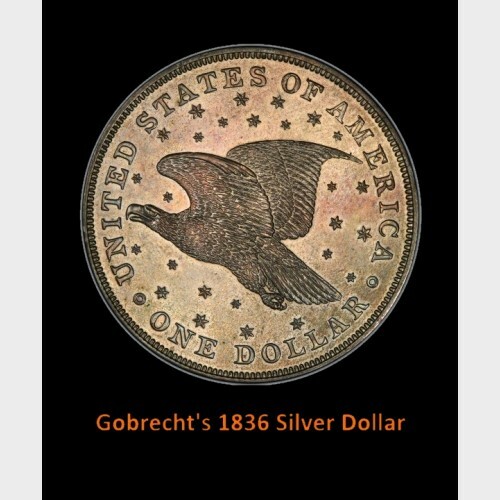 With most coins this is more than just a “date and mint mark” story. For example, there’s the public reaction to the coin as introduced. Was the coin perceived as useful, solving a problem, or confusing and annoying? What about the legality of the coin for paying all debts public or private? Was the coin readily accepted by all? What about the design? Artistic, bland, or downright ugly? How did economics and politics influence its introduction? With the Flying Eagle Cent, you can profitably explore all of these to really understand the coin you either already own, or plan to acquire. 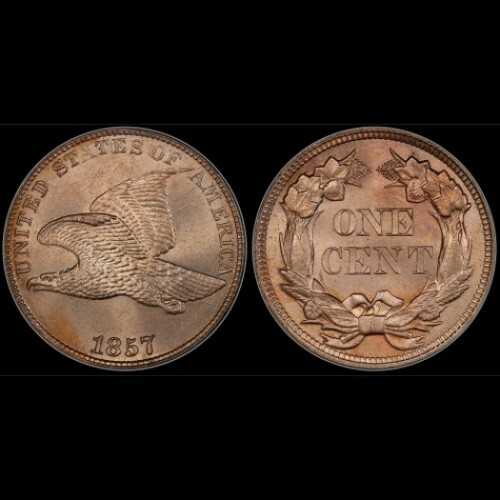 The Flying Eagle Cent’s predecessors, the large copper cents made from 1793 – 1857, had waned in popularity to say the least. Inflation had diminished their value, they were big, old, clunky, and dirty and people just didn’t like having to haul them around. Not only that, they were – by law – not legal tender for the payment of taxes to the Federal Government. Who would care about that? Merchants mainly. And so, many merchants decided not to accept the large cents from customers. And to, add insult to injury, the government backed them up. Large cents had become a nuisance! Then, a new law was passed. The Coinage Act of 1857, among many other things, decreed a new small cent to replace the large cent. It weighed less than 43% of the older coin. And it was legal tender for everything. You could spend them anywhere. And everyone had to accept them – by law. So much for Popularity and Legality. 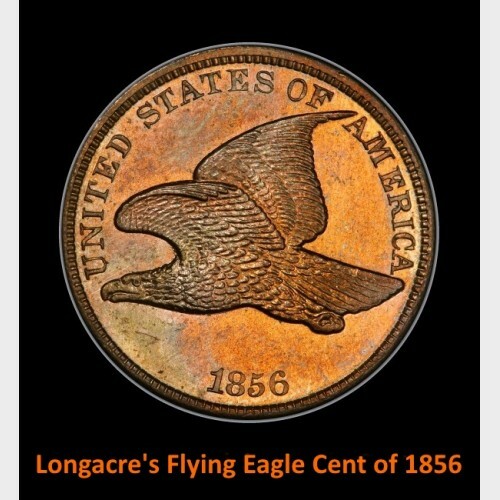 The proposed small cent design, by James B. Longacre, featured an eagle in full flight across the face of the coin. A glorious rendition of a national symbol recognized by all. 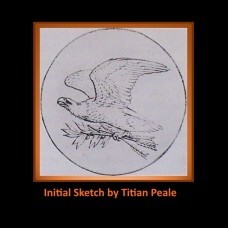 The eagle is very close to the reverse design of the 1836 Dollar. 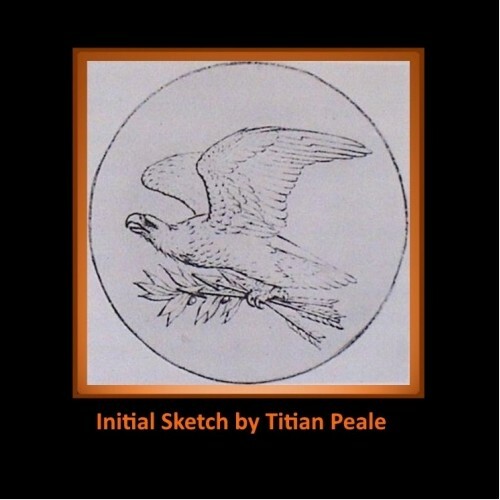 Christian Gobrecht, an assistant engraver at the Philadelphia Mint had reworked a sketch submitted by the noted American artist and naturalist Titian Peale to be used as the reverse of the first Seated Liberty silver dollars. On that coin the eagle is on an upward flight among stars representing the original 13 states. Longacre removed the stars and pitched the eagle into level flight. 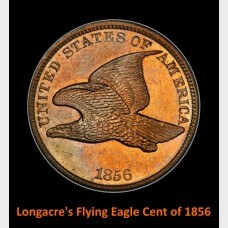 Both are stunning images, but for the much smaller one cent coin the simplicity of Longacre’s design works best. In the face of public disaffection for the large cents, and the emerging realization that it cost the mint $1.06 to make 100 of them, a man named Joseph Wharton stepped forward with suggestions. To make a lighter cent with even greater durability and less expense he proposed a copper-nickel alloy. Wharton, who later founded the Wharton School of Business at the University of Pennsylvania, owned nickel mines in the western US. As Wharton was well connected to the federal legislature, the mint struck off 1000 trial pieces (pattern coins,) to hand out to members of the US Congress to demonstrate the beauty and potential utility of the coin. Not surprisingly, these coins were made in an alloy of 87.5% copper, and 12.5% nickel. Modern “K Street” lobbyists would nod in approval! Massive production of the regular issue Flying Eagle Cents began in 1857. The 1856 is a highly sought and very valuable rarity. Although the new cents, with their minor component of nickel, had a pinkish color in their uncirculated state, all was not rosy on the production line. After 2 years of Flying Eagle Cent production, in 1859 a new Longacre design was tried – the Indian Head cent. These struck up better, but not right away. The copper-nickel alloy was still too hard to deal with so, in mid-1864, it was abandoned in favor of “French Bronze,” a softer, more malleable alloy of copper and tin. At our store, we have most or all these coins in various grades, some of which are shown on our site. Drop by to see our entire inventory. We may not always have an 1856 but who can predict the future?